Construction Notice: During the 2019-20 academic year, we may be replacing the aging brick façade of Crosby Hall. We may also weatherproof the building to improve insulation and replace all windows. If the project begins during the upcoming year, work will continue through spring semester. 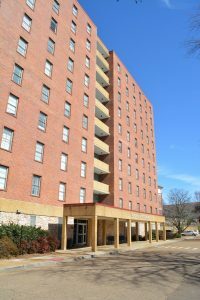 Residents would be impacted by noise, the window replacement process, and the presence of construction professionals and student housing staff. The largest residence hall on campus, Crosby has 10 floors for living and houses almost 700 residents. The second through tenth floors are composed of three wings with a kitchenette and lounge at the center. The first floor houses residents on one wing and has a lounge, a laundry facility, and staff housing on the others. Crosby Hall residents sign a contract for the academic year. This building closes during breaks. The Campus Post Office and a P.O.D. Market are located here.